Mom’s Cookies is a series of short silent videos showing packaged convenience foods prepared from start to finish by a well-coiffed mother figure. 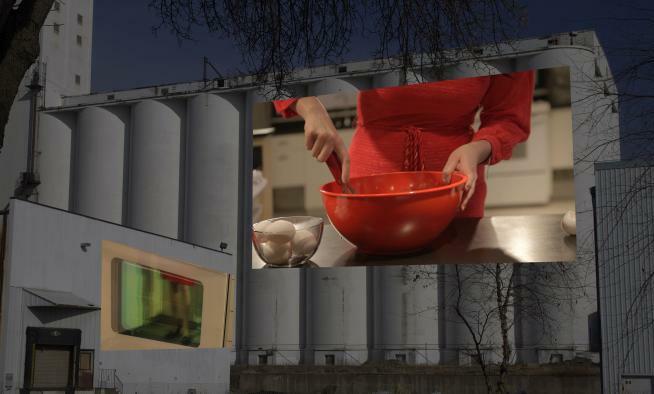 The videos will be projected onto mill buildings near St. Anthony Falls on the Mississippi River. These videos commemorate this area of the Mississippi River as the birthplace of modern packaged foods. Viewers will have the opportunity to watch the product of the waterfall’s power literally rise in the oven, with the waterfall itself as a backdrop. St. Anthony Falls and its natural source of energy attracted settlers and industry in the nineteenth century, first as the site of sawmills and later flour mills. The Minneapolis flour mills (many of which later merged into General Mills) developed innovations in flour production, which led to Minnesota flour being the highest rated in the country for fineness and quality. In 1931 General Mills further revolutionized food production in the United States with its introduction of Bisquick, the nation’s first baking mix. With Bisquick, the age of packaged and boxed foods was born, completely changing how Americans, and many of the people throughout the world, eat. Mom’s Cookies reminds viewers of the history of the mills and their importance to contemporary food production and consumption. Homemade baked goods have a powerful hold over the American psyche. Mythology about mothers and grandmothers baking magical frosted delights in the kitchen play into our ideas of what it means to be loved and cared for. Home-cooked meals represent our greatest desire for comfort and security. Mom’s Cookies asks the viewer to contemplate the technological advances that occurred at this site of natural wonder and power, as well as the depth of the social and economic changes they brought to our society. Rosemary Williams is a multimedia artist whose work spans video, audio, performance, and installation. She has been awarded the Jerome Foundation Fellowship for Emerging Artists and other grants, and she exhibits her work internationally, including recent shows in Berlin, London, and the Czech Republic. She is now making her first feature film.